Unicorn Dreams Wholistic Touch - Canine and Small Animal Bodywork FAQ"No matter how little money and how few possessions you own, having a dog makes you rich.." ~ Louis Sabin Keep up with us on our Blog! "No matter how little money and how few possessions you own, having a dog makes you rich.."
You will see a positive difference in your animals movement and/or behavior in two sessions, or your money back. Massage is the manipulation of the muscles, tendons, ligaments and tissues of the body. It also supports and resolves issues in the musculoskeletal system. The same techniques used in human massage are applied safely and effectively in animals. Massage is a natural method of managing your animal's health and prolonging quality of life. Can you diagnose my animal's illness/lameness? No, that is a job for your veterinarian. Massage is never used to diagnose or treat pain or injury, or prescribe or administer treatment of any nature for the prevention or relief of bodily injury. What types of dogs should get a massage? 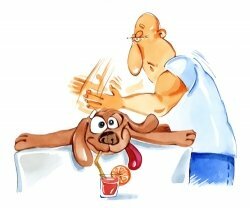 Massage can increase comfort and promote joint mobility in older dogs, and can quickly acclimate puppies to human touch. Using massage on post-operative dogs can shorten recovery time, and dogs with emotional issues often relax after massage sessions. Competitive canines enjoy improved athletic performance, and even dogs without any specific health problems benefit from maintenance massages. How often should my dog/animal get a massage? The frequency really depends on a number of factors, including: the animals age, workload, show schedule, and overall health. On average, most dogs benefit most from a massage every 6-8 weeks. Will bodywork affect my animal's training/show schedule? No. While, on occasion, some may experience a slight stiffness the day after bodywork, you do not need to alter your show/training schedule. Are there times when my animal should NOT be massaged? Why do you massage the entire animal when only a specific muscle seems sore? It is important to evaluate the entire animal. Often, the muscle that seems the most sore is compensating for an underlying issue. A full-body massage is necessary in creating an overall balance in the body. Note: Massage is never a substitute for veterinary care. If your animal needs immediate assistance, please contact your veterinarian promptly.